If you follow me on twitter, you know I have been impatiently waiting for Target to come out with new home decor. I've literally been checking Target's website almost daily to see if they've released anything since the whole back-to-school season has come and gone. Today I have great news for you guys, TARGET HAS NEW HOME DECOR. Yes. Finally. And I am very content with what they've released. The new stuff Target has been putting out is definitely on the verge of "Urban Outfitters" vibes and I am definitely here for it. I am definitely an advocate for splurging on some staple pieces in your home, I think mattresses, a nice headboard and couch are the important things to invest your money in. I do not believe that home decor should be expensive so save your money and shop around for the best deal! That is why I love Home Goods and Target so much. In order for a house to feel like a home and not something straight out of a catalog, I think it's important to mix and match pieces from a variety of different places and different styles. It needs to be you. This is where Target comes in handy! If you're just now moving into a new place and are on the hunt for some inexpensive essentials like coffee tables and chairs, Target also recently put out their new Project 62 line, I'm a fan, it definitely gives an overall midcentury modern vibe to a place for a decent price. Definitely check that out too! 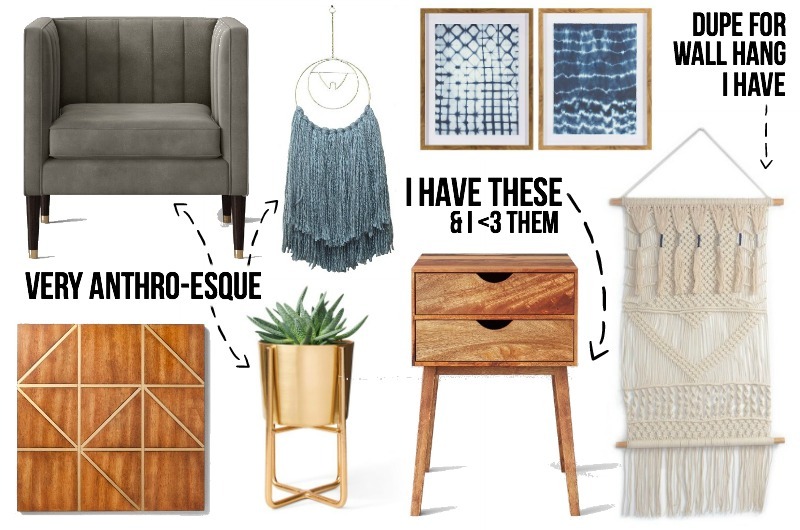 The grey velvet chair in the collage is so perfect if you want an "Anthropologie look" but don't want the price tag, this kind of chair would normally retail you close to $1000 at Anthropologie and at Target it goes for $250... Yeah. A forth of the price. Easy decision there. The only thing is it comes in only 2 velvet colors, navy and grey and the other two color options are a normal fabric. I think the velvet really gives it a luxe factor. Now I know you are probably now wondering what I will actually buy from their recent launches. I am ordering that gold planter ASAP for one of my cacti, the gold will look so flashy in my apartment, so obviously I need it. I want those blue art framed pieces because I love the indigo trend right now but unfortunately I've ran out of wall space, so buy it for me, put it in your place and tweet me pictures of them so I can live vicariously though you all. Oh gosh, I'm officially a Target addict. SOS. So what will you be buying from these recent launches at Target? Or have you already bought something from their new home department? I'd love to know in the comments. I'm so excited to head to Target to see how everything looks in real life. This post is giving me life.������������ Target & Homegoods have such great boho pieces!! RIGHT?! I am itching to go to Target!!! Hi sarah I know that you got your floor mirror from ikea and now I'm having a hard time finding it. Can you help me out?